What is powdery mildew? Powdery mildew is a disease that occurs on the above-ground parts (especially the leaves) of many deciduous trees and shrubs, as well as herbaceous ornamental plants, indoor houseplants, and many agricultural crops. Conifers are not affected by this disease. 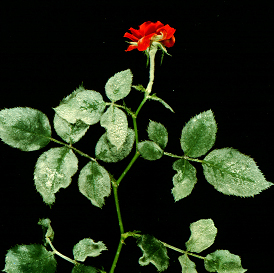 Many woody plants such as rose and lilac are susceptible to powdery mildew. What does powdery mildew look like? The name of this disease is descriptive. The upper and (less frequently) lower surfaces of leaves, as well as stems of infected plants, have a white, powdery appearance. They look as though someone has sprinkled them with talcum powder or powdered sugar. Where does powdery mildew come from? Powdery mildew is caused by several closely related fungi that survive in plant debris or on infected plants. These fungi are fairly host specific. The powdery mildew fungus that infects one type of plant (e.g., lilac) is not the same powdery mildew fungus that infects another (e.g., phlox). However, if you see powdery mildew on one plant, then weather conditions, usually high humidity, are favorable for development of the disease on a wide range of plants. How do I save a plant with powdery mildew? DO NOT panic! For many trees and shrubs (e.g., lilac), powdery mildew is a cosmetic, non-lethal disease. For other plants (e.g., rose, ninebark) powdery mildew can cause severe leaf loss and even branch tip dieback. When a highly valued plant has had severe leaf loss due to powdery mildew for several years, you may want to consider using a fungicide for control. Fungicides containing dinocap, dithiocarbamates, myclobutanil, triadimefon, triforine, sulfur or thiophanate methyl are registered for use against powdery mildew. A combination of baking soda (11∕2 tablespoons) and light weight horticultural (e.g., Sunspray®) oil (3 tablespoons) in water (1 gallon) has also been shown to be effective for powdery mildew control. Most products should be applied every seven to 14 days from bud break until humid weather subsides. Be sure to read and follow all label instructions of the fungicide that you select to ensure that you use the fungicide in the safest and most effective manner possible. Also consider pretesting any product you decide to use on a small number of leaves or plants before treating a larger area to make sure there are no toxic effects, particularly when treating during warmer weather. How do I avoid problems with powdery mildew in the future? Consider buying plant varieties that are powdery mildew resistant. This won’t guarantee that your plants will be powdery mildew-free every year, but should result in less severe disease when it occurs. Reduce the humidity around your plants by spacing them further apart to increase air flow. Be sure not to over-water as this can lead to higher air humidity as well. Finally, at the end of the growing season, remove and destroy any infected plant debris as this can serve as a source of spores for the next growing season. For more information on powdery mildew: See UW-Extension Bulletin A2404 or contact your county Extension agent. Thanks to Bill Halfman, Laura Jull, Patti Nagai and Amy Sausen for reviewing this document.